FrostWire Turbo Booster (Popularity: ) : So easy to make your downloads easier! 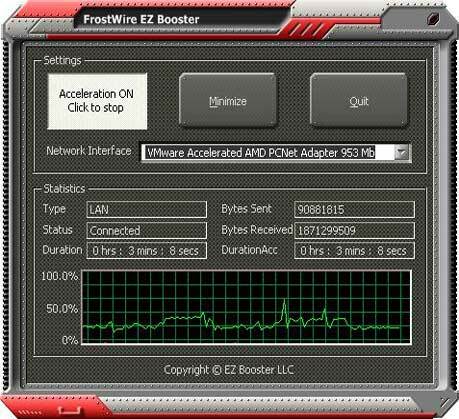 Azureus EZ Booster (Popularity: ) : Tired of sluggish downloads? BitComet EZ Booster (Popularity: ) : Waste no more time with slow downloads and poor Internet connection! FrostWire Download Thruster (Popularity: ) : FrostWire Download Thruster is a condensed plug-in that manages to horde in its lite architecture some powerful features designed to foster new high levels of speed for your downloads. ALEXA BOOSTER - WATCH YOUR TRAFFIC RANKINGS GROW (Popularity: ) : ALEXA BOOSTER - WATCH YOUR TRAFFIC RANKINGS GROW is windows compatible. ...software that will increase your site ranking's in no time! Amazing Ez-powercart Free Shopping Cart (Popularity: ) : EZ-Powercart.com Your one stop e-commerce resource center! If you own or need an ecommerce site we can save you $$$! Free CGI shopping carts, free web hosting, free tools, free guides. ASP EZ-GuestBook Lite (Popularity: ) : ASP EZ-GuestBook Lite is a simple ASP GuestBook script that does not require any components. It can be used on its own, without any other installations.